Tomorrow (Friday) FIRST Union members at ANZ are going on strike, speaking out against bank proposals that would be highly disruptive to family life. This update to CTU affiliates details how you can support FIRST Union members involved in the strike. Information about the dispute is at the base of this page. 1 – Messages of solidarity If you wish, email a short message of solidarity to sam.huggard<mailto:sam.huggard> today or tonight and it will be read out at rallies tomorrow morning. Our members really appreciate this. Unite was always looking to ways to bring our members additional benefits. In late 2006, Unite contracted with Te Wananga o Aotearoa – a Maori-led tertiary institution – to offer computer classes for union members. We set up a Unite school in central Auckland and provided classes days and evenings, seven days a week, so our members could attend. A casino worker on a rotating 24-7 shift could enrol and complete a course. For a few years, one of the main buildings in Queen St was named “Unite House” with red flags flying from the roof – much to the consternation of friend and foe alike. Thousands of workers graduated from these courses. 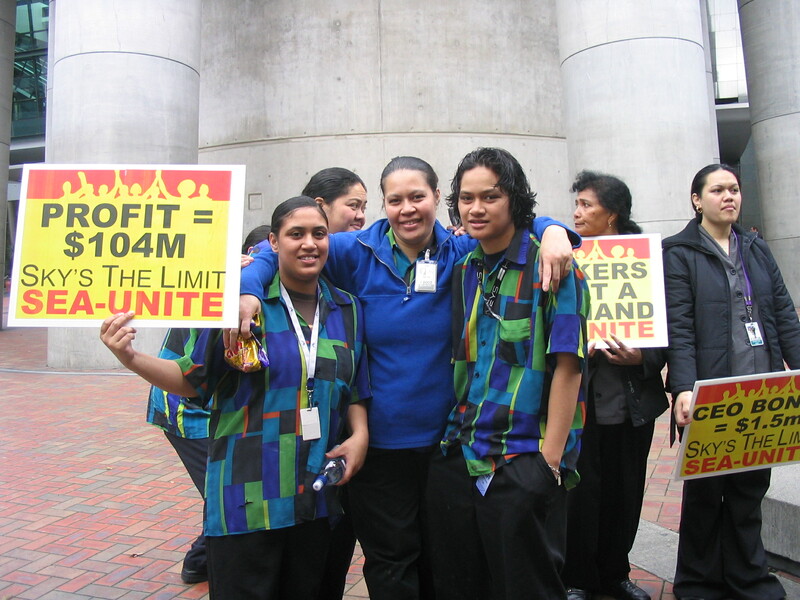 In July 2006, SkyCity casino workers won pay rises of 5-9% after a campaign of two-hour, all-out strikes several times a week combined with rolling strikes by department. The company was taken by surprise at the determination of the SEA-Unite members. In late 2006 and 2007, Unite unionised a factory owned by Independent Liquor at the request of some workers. This was a very anti-union employer. Strikes and pickets were needed to get a collective agreement, the first in the company for 20 years. After a while, however, we realised that we were probably getting beyond core business and agreed to allow the Engineers Union which covered workers in other liquor manufacturing plants to take over representation. Unite also extended its representation with a hotel campaign involving strikes (and occasional lockouts) at a number of hotels in early 2007. The ADT-Armourguard monitoring centre struck on Christmas Eve – the busiest night of the year to secure an improved offer for a renewed collective agreement. 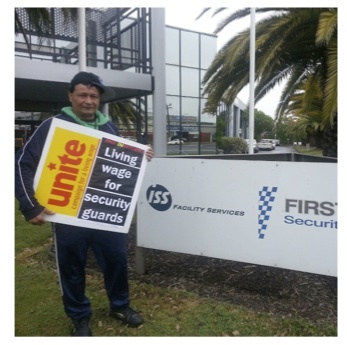 The Unite bargaining team has received a settlement offer of the Collective Employment Agreement from FIRST Security. As a part of the bargaining process members of Unite Union are required to vote on the offer before it can be completed. The offer will be accepted if the union members concerned ratify the settlement by 50% plus one person accept it. How can I attend these meetings? On-Shift attendance: Staff who attend a meeting inside their rostered shift will be paid for 2 hours and are required to R.S.V.P to their Manager and Unite Union by Friday 14 June 5pm. Off-Shift attendance: Staff who attend a meeting outside their shift will be paid for 3 hours. Registration will be required upon attending the meeting. Unable to attend: Contact Unite Union for copy of the offer and to find out how you can register your vote. For more information contact Shanna Reeder, Unite Union Security Organiser on 0800 2 Unite or 029-445-5703. First Security Claims meeting – Have your say! We are now entering bargaining for a new agreement. Please choose only one meeting, staff who attend a meeting inside their shift will be paid for 2 hours and need to R.S.V.P to their Manager and Unite Union. Staff who attend a meeting outside their shift will be paid for 3 hours. The choice is yours. It is important you attend one of these meetings to have your say! -Dangerous work, alone, sometimes without comms equipment. -No backup when things go wrong (client always comes first, guards don’t feel backed up by their employer. -High staff turnover leading to breakdowns in communication and loss of organisational knowledge. Unite aims to improve conditions for guards in the above key areas. So far we have met with the New Zealand Security Association and corresponded with Member of Parliament Chester Borrows. Keep updated on our facebook page http://tinyurl.com/b26jlke. The First Security C.E.A expired on 31 January. All First Security staff should have been informed by the company that Unite Union has initiated bargaining to negotiate for a new agreement. All members need to make sure they come to one of the “claims meetings” which will be held in February to make you voice heard and offer your suggestions of what you would like to see in your new agreement. Delegates will represent the membership at the negotiation meetings and will keep you informed during the process. Member participation is key in all aspects of the negotiating process so please keep up with the txts, emails and newsletters that are coming out. Your current CEA expires 31 March 2013. Initiation for a new round of bargaining has been made and members should have received notice from Armourguard regarding this. Txts and emails will be sent out this month to let you know when we will be having “claims meetings” to discuss what you would like to see in your next agreement, and a strategy of how to get it. We will also be electing some new delegates to support our existing delegates so it is important you attend. Icon Security staff recently found out their company has been bought by Global Security Services. At this stage all union members have been offered employment which appears equal to their Icon positions and remuneration however if workers have questions they should contact Unite Union. 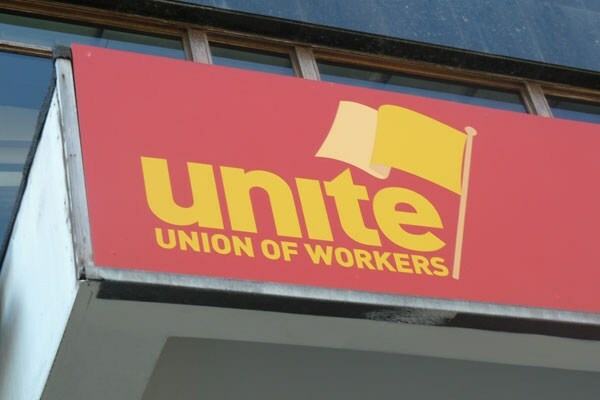 The Unite office has received multiple calls this month regarding issues with pay including workers being underpaid, workers being overpaid and even workers earning an incorrect pay rate for long periods of time. Pay is an important issue to get right and each company has a process for dealing with payroll problems so if you are not clear on what to do when a mistake happens at your company either approach your employer directly or contact the union. Most pay issues are simple mistakes and can be quickly and easily rectified. Training is the second most common complaint and it is apparent that many guards are desperate to complete their Levels 2 and 3. 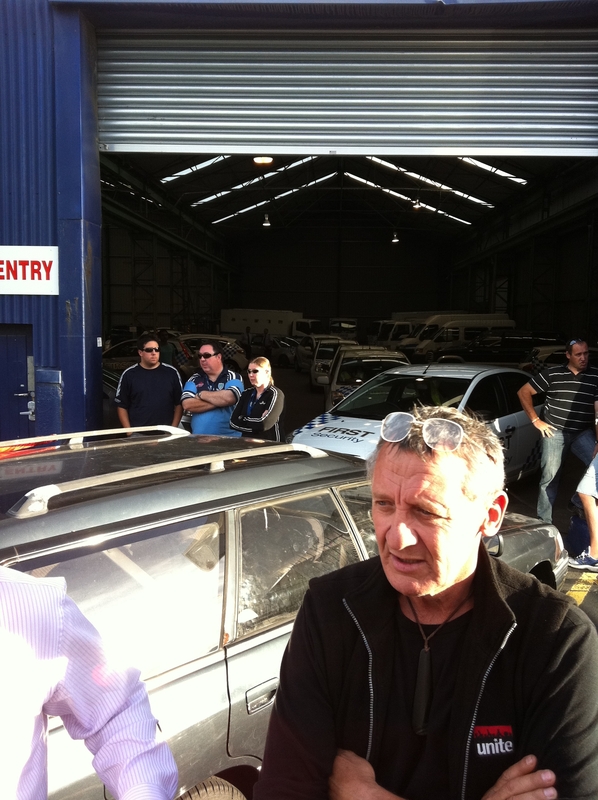 One of our goals is to see more Officers complete training in 2013 so let us know if you need help to make this happen! The Security Organiser has also dealt with several disciplinary cases recently involving Security Officers. It is important that you make use of the representation available to you through Unite Union so do get in contact with a delegate or the Organiser if you receive a letter inviting you to a meeting. Regardless of fault it is important that a correct process is followed and that you receive fair and accurate representation to achieve the best possible result. Quentin joined Unite in February 2012 and became a Union Delegate in November 2012. Since then he has made a big impact. Quentin attended the Unite national AGM and Conference in November and received delegate training. He has demonstrated strong leadership skills, has recruited some members and advised them on solving their issues. Thank you Quentin for your service. If you haven’t already, take the time to get to know your delegates. Members please feel free to communicate with your delegates as your first point of call in your workplace. We run delegate training several times a year so your delegates have up to date information and training to advise you. Delegates can support you at disciplinary meetings (we believe you should never go alone) and help you to identify whether your issue is a small one you can rectify yourself or with their help, or whether you need to contact the union. Your delegates will also represent you during negotiations so if you have any questions, comments or suggestions please approach them. Legally, it is your individual right to decide if you want to belong to a union. It is against the law for a Manager or Supervisor to discourage you from joining or to try to get you to resign from the union. Unite Union takes cases of discrimination, harassment or bullying against union members very seriously. We will not put up with it and you shouldn’t either. If this happens to you or your workmates get in touch with us immediately. Want a better deal? How about a payrise? If you have negotiations for a new Collective Employment Agreement that will soon be underway and you would like to get involved please let us know. You can be a delegate and attend the negotiation meetings, and you can also help by talking to your workmates about the union and helping them join up if they want to be part of it. You can help to get a better deal by talking to your workmates and making sure that anyone who wants to be covered by the union agreement joins up so they receive the extra benefits! Both Employers and Employees have a duty to keep themselves and each other safe at work. The New Zealand Security Association has a code of practice policy which states that Security officers “should be provided with the most appropriate and robust equipment required to deliver high levels of service for the client.” In addition, all guards should have a way to contact base and base should also be performing a welfare check of guards every 60 minutes. INSECURITY campaign outside ISS offices, a photo by uniteunion on Flickr. 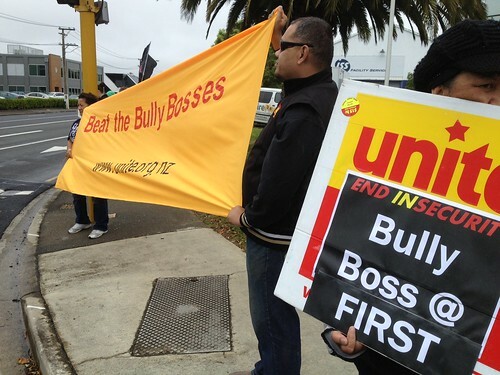 First day of Unite’s INSECURITY campaign against bullying in the Security industry.